Film adaptations can come with a lot of baggage, especially those of novels you love. As a teenager when I read a new horror novel I would imagine a glorious film adaptation, picturing each scene brought to life visually, absolutely faithful to the source material. It took me an embarrassingly long time to appreciate that film and books are two very different media, and that slavishly faithful adaptations are not always a good thing. I would complain “They left out the best part!” or “Why did they have to change it?” all too often. Sure, sometimes the changes made in adapting books seem like bizarre, ego-driven mangling by someone who should have known better, but on the whole I would rather see a film made by someone who knows how the material has to work in its new medium. There is a reason why Kubrick’s version of The Shining tops critics’ lists, but few people waste breath defending Mick Garris’s far more faithful TV mini-series. Even then, it is sometimes hard to suppress that sigh of disappointment when a favourite character or scene doesn’t make it to the screen. Joe Hill is one of my favourite horror writers of recent years. I’d like to believe that he would have been just as successful had he not been outed as Stephen King’s son. His work is fuelled by a rich imagination unconstrained by genre, and I find myself constantly surprised and delighted when reading his books. Horns is my favourite of his three novels to date, and it was always going to be difficult to look at the film on its own merits. Happily I’ve managed to forget a fair amount of detail in the four years since I read it, so while I was vaguely aware that a few plotlines and supporting characters had been excised to keep the film down to size, nothing really jarred. The film worked for me as an adaptation, retaining the key plot points and tone that I remembered, breathing visual life into them. This is not going to be much help to you if you’ve never read the book, however. Ig Perrish has become an outcast in his small logging community following the recent murder of his girlfriend Merrin. While he has yet to be arrested, everyone is certain that Ig killed her; their last meeting was a loud and public argument, and Ig was blackout drunk at the time of her death. As Ig’s anger and isolation mounts, he finds himself changing, slowly becoming the devil every accuses him of being. Horns start growing from Ig’s forehead and when people see them they confess all their darkest secrets and desires to him. While this may seem like a gift to someone seeking truth, it pushes Ig into deeper realms of nightmare. 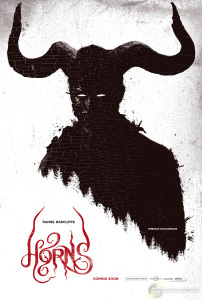 Horns was completed a couple of years ago, and, after its premiere at the Toronto International Film Festival in 2013, has been been a fixture on the horror film festival circuit. The delay in its theatrical release led to dark rumours that the film was a catastrophe, requiring massive reshoots, and may not be released at all. This was not helped by the decidedly varied word-of-mouth, and the reviews accompanying its current release have been similarly mixed. While I won’t pretend that Horns is a perfect film, I wonder if many of the negative reactions are born of confounded expectations, with the film being marketed as something it’s not. While there is plenty of darkness on display here, Horns is not really much of a horror story. Although there is blood and death aplenty, Horns is largely the tale of a young man who has lost the love of his life and needs to find out why. It is a tragic story that, even in its truncated form, builds slowly and relies on emotional engagement rather than shock. It is also an allegory for how the drive for vengeance changes and destroys us. That’s not to say that this is a depressing film — there are plenty of laughs, especially as Ig becomes the unwilling confessor for the fucked-up impulses of everyone he encounters. There is also enough action and intrigue to keep the pace going, and none of the two-hour running length drags. The last half hour is relentless, and frustrated horror fans waiting for the good stuff may find some redemption here. The only irritation I found in Horns was some of the dialogue, especially in the early scenes. In his attempt to foreshadow and build some thematic elements, scriptwriter Keith Bunin tries to shoehorn in every possible allusion to the Devil, Hell or demons in general, and the characters end up uttering lines that become stilted in order to contain them. Happily as Ig grows more demonic in form, the script is allowed to step back and stop hammering us over the head with such references. Director Alexandre Aja came to prominence as part of the wave of extreme horror that came out of France last decade with his film High Tension, and has since cemented his reputation for gore with the remakes of The Hills Have Eyes, Piranha and, as screenwriter, Maniac. Horns is a major departure from such work, and fans of Aja may be frustrated with how tame it is. Similarly, I wonder if the casting of Daniel Radcliffe also brings a set of expectations that Horns can never meet. He gives a terrific performance here, packed with emotion, helping convince us of the reality of Ig’s transformation and the insane reactions it brings. I can’t help but wonder what Radcliffe’s fanbase will make of this film, but they should be used to the fact that he’s no boy wizard any more. If it weren’t for some exceptionally strong competition, Horns would undoubtedly be my pick of this year’s challenge. It may not be overly horrific, and the shifts in tone and genre could prove too much for some, but it is moving, packed with surprises and never dull. This was a wonderful way to cap off the month.